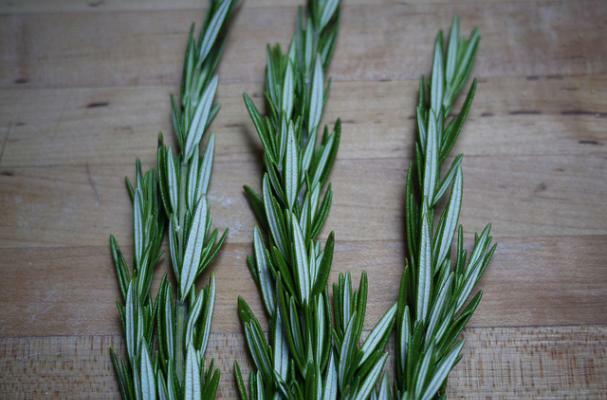 Many people are puzzled by how to handle rosemary. Do you have to pick each and every leaf off one by one? What do I do with the stem? What’s the best way to cut it? Herbs can be daunting to many home cooks, but once you learn the proper way to handle them you’ll soon be chopping and chiffonading in no time! Watch the video as Dan Gilmore, executive chef at Seattle’s historic Sorrento Hotel, shows us how easy it is to handle hard herbs like rosemary, thyme, oregano, and more. He demonstrates how to remove the leaves from a rosemary stem in one swift and easy movement, then how to finely chop up the leaves for cooking. Food Trivia: did you know that rosemary is considered the herb of fertility? Watch the short how-to video below and be sure to subscribe to Foodista’s Kitchen Secrets for more how-to tips and tricks. Click here to learn how to chop soft herbs, such as basil, mint, tarragon, like a pro! This is Dan Gillmore, executive chef at the Sorrento Hotel in Seattle, Washington. I’m going to demonstrate how to cut hard herbs. I’m using rosemary but this also goes for thyme or any herb with a hard stem. First thing you want to do is grab the top and just pull the leaves off. This is the same with thyme. Anything that will come off in that stripping motion is edible. You’re just going to pile up the leaves and just put your knife down and come across the leaves. An you’re basically only going to run your knife through three or four times. Rosemary goes fantastic with braised meats, also roasted meats. It is the herb of fertility, if that’s what you’re after. That is basically all you have to do!